Cathy Brennan, in one of her blogs titled Name The Problem, has again named me a violent man in her post <To the Victor Go the Spoils. She tweeted her link to her post here. 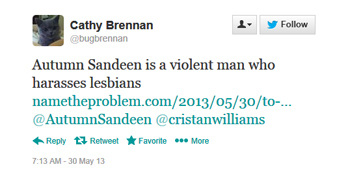 Brennan refers to a piece on GenderTrender by GallusMag entitled A GenderTrender Chat with Autumn Sandeen. In that post, GallusMag published much, but not all, of a private, non-public conversation I had with her on Twitter. In that conversation with GallusMag I used some choice language — four letter word language — that I really regret. Among the four-letter related names I called GallusMag was “fuckwad” — it wasn’t a pretty conversation, for sure. Hey, I succumbed the the temptation of bitterness; I failed to avoid internal violence of the spirit; I failed to use means as pure as the ends my community seeks. Basically, I didn’t live up to Martin Luther King Jr.’s Six Principles of Non-Violence. I could make excuses for my failure in this, but that wouldn’t change anything for me: I still failed to live up to my own standards. I was completely wrong in using four-letter language towards GallusMag. I’m sorry I used such language to her, and I fully apologize to her for that inappropriate language of mine. I’m going to be mindful of my frame of mind when I respond to others in the future, and do that “count to ten” count when I’m passionate or angry because I know that my words written or spoken in the passion of a moment are often inappropriate and hurtful…and are often words I later regret. And, I regret the written words — the four-letter name calling — I used in communicating with GallusMag. So, to GallusMag directly: I’m sorry. I was wrong. I failed. I won’t engage in that kind of bad behavior towards you again. And too my trans subcommunity of the LGBT community, I’m sorry I failed y’all in giving GallusMag and Cathy Brennan fodder for identifying trans women as a class of people as a violent people. That’s a fail I’m going have to live with for a long time; it’s a fail I’m going to work not to repeat.